You can’t see, smell it or taste radon gas…but it may be a problem in your home…and it can be dangerous. Radon is a cancer-causing, radioactive gas. 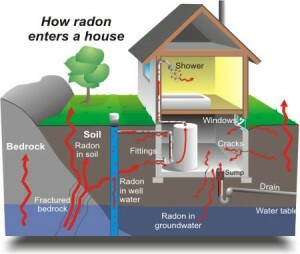 Radon comes from the natural (radioactive) breakdown of uranium in soil, rock and water and gets into the air we breathe. Radon can be found all over the U.S. It can get into any type of building – homes, offices, schools – and result in high indoor radon levels. This means new and old homes, well-sealed and drafty homes, and homes with or without basements. Testing is inexpensive and easy it should only take a few minutes of your time. Millions of Americans have already tested their homes for radon. Radon-resistant construction techniques can be effective in preventing radon entry. When installed properly and completely, these simple and inexpensive techniques can help reduce indoor radon levels in homes. ?In addition, installing them at the time of construction makes it easier and less expensive to reduce radon levels further if these passive techniques don’t reduce radon levels to below 4 pCi/L. Every new home should be tested after occupancy, even if it was built radon-resistant. If radon levels are still in excess of 4 pCi/L, the passive system should be activated by having a qualified mitigator install a vent fan. For more explanation of radon resistant construction techniques, refer to EPA publication,?Building Radon Out: A Step-by-Step Guide on How to Build Radon-Resistant Homes (see www.epa.gov/radon/rrnc).